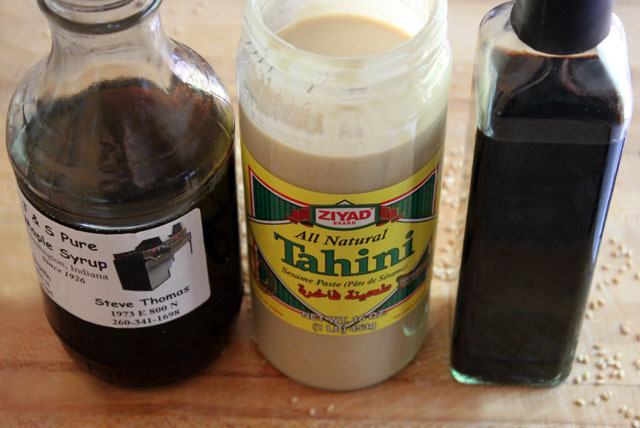 There’s a sauce I’ve been digging, and it goes like this: whisk together equal parts tahini (sesame paste), maple syrup, and balsamic vinegar / season with salt and pepper to taste / toss with your favorite noodles or use as a dip for your favorite prepared veggies. This combo is simple, perky, nutty, and just sweet enough (I think I wouldn’t mind being described that way – ha). 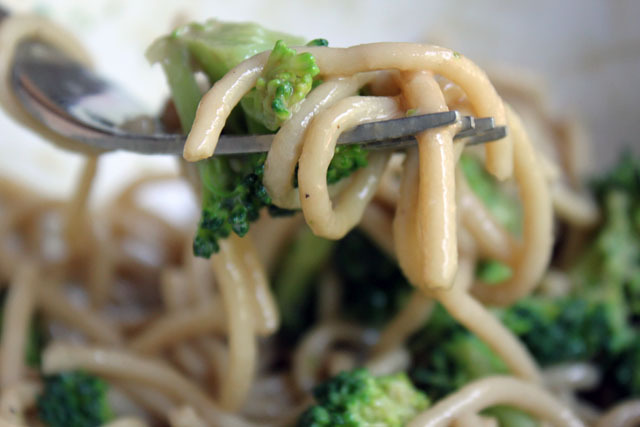 Lately I have enjoyed the sauce on sweet potato/buckwheat noodles with toasted sesame seeds and over brown rice noodles and steamed broccoli (the latter I enjoy most as a cold noodle dish; it’s toothy and all the more flavorful after fridging overnight). 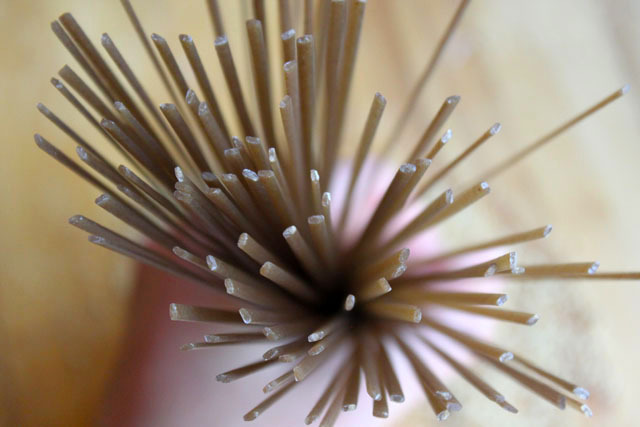 If you are using this sauce with noodles, be sure to first anoint the noodles with a little olive oil before mixing in the sauce. An 8 oz. package of noodles needs about 2 tablespoons of each sauce ingredient. OK cousin, where do I get the Indiana Maple Syrup? A neat farm on the northside of town – they have an order form: http://www.yoderfarm.com/syrup.html I bought this jar from a farmstand about 10 miles from where I live – I can always box some up for you and send it to TX! 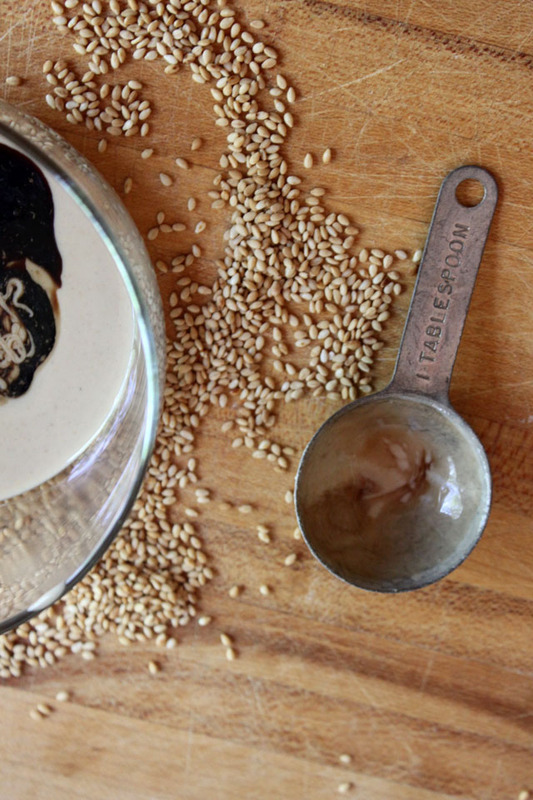 Can you get Japanese sesame oil where you are? It’s very good. Light or dark. Thanks! I will look for some. I know some stores have sesame oil, but I am not sure if they have Japanese sesame oil. How do you like to use it? 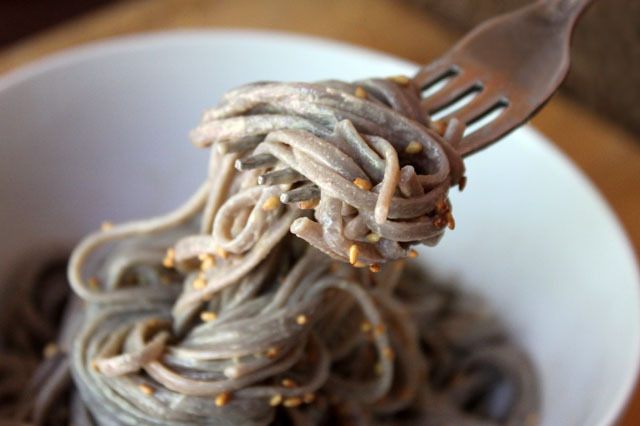 As you might use olive oil with pasta so in the above “soba” recipe you could probably substitute the sasame paste with the oil. I’m not sure how mixing it with maple syrup would be though! I might try that. Can you get ginger syrup? Otherwise, I imagine honey would be tasty, too! I will have to try that out next 🙂 You might need a little hot water in the mix if your honey is extra thick. 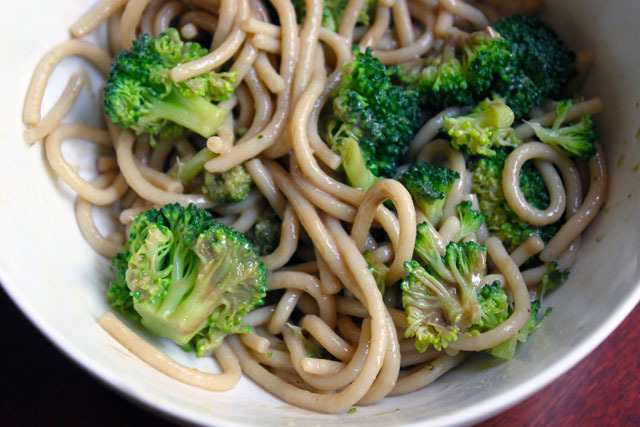 Had this for lunch again — with soba and broccoli. Added some minced garlic and a dash of hot sesame oil to change it up a bit — yum!